You perform the deadlift movement every day, and probably don’t even realize it. Picking up a loaded laundry basket off the floor. Picking up a box to load in your SUV because you’re the friend who has an SUV and you inevitably get asked to help everyone you know move their crap. Because you deadlift every day, in some fashion, doesn’t it stand to reason that training the movement progressively (i.e., with a barbell and adding weight over time) in a controlled manner can be beneficial? I’ll answer for you: yes, yes it does. Yes, because you can learn proper lifting mechanics with the barbell deadlift, so you’ll be less likely to get injured when you pick up a heavy object from the floor in daily life. Yes, because being strong makes you more resilient and less prone to injury. Yes, because deadlifting builds muscle and bone and just makes you a more capable human being. The only good reason not to deadlift is if you’re physically incapable to do so (e.g., you’re injured, have a preexisting condition, etc.). When you hear the word “deadlift” a certain image may pop into your mind. Perhaps you see a woman or man grinding out a brutally heavy single rep at a powerlifting meet and you instinctively duck because you don’t want one of their bulging eyes to pop out and smack you in the face. Perhaps you imagine the sound of bones crackling and spinal fragments exploding out of someone’s low back. Perhaps you see yourself dominating one and a half times your bodyweight for a clean set of three reps. 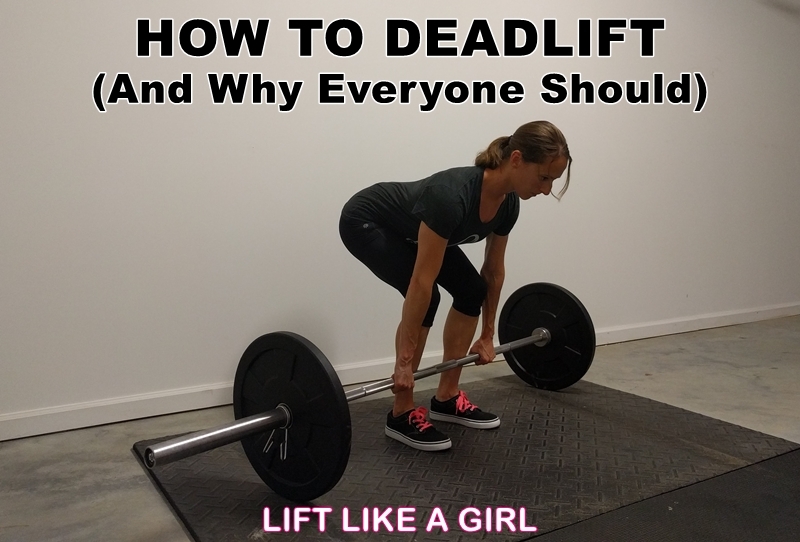 Depending on your personal experiences, and what you’ve heard from different trainers/people/doctors/fellow gym-goers who fancy themselves an expert, you’ll associate deadlifts with something: awesomeness, danger, empowerment, etc. The truth is, getting strong makes you more resilient and less prone to injury. And the deadlift movement is one of the best exercises to build total body strength. Most people pick up a box or other object without even thinking twice. Daily life requires picking things up and putting them down. Deadlifting a loaded barbell is safe, as long as you don’t have any preexisting conditions that prevent you from performing the movement, and, this part if critical, you use proper form. Deadlifting is safer than, say, picking up a heavy box from the floor. Unlike a heavy box, the weight is distributed evenly on a loaded barbell (unless you make a loading mistake and put a 10-pound plate on one side and a 5-pound plate on the other) and you lift the weight in an efficient vertical path (i.e., straight up and down) over your body’s center of mass. You control how much weight goes on the bar (you can start with a light weight to learn proper form and gradually add more). You can control the range of motion (i.e., elevate the plates to shorten the range of motion, if necessary). Contrast a barbell deadlift with a large awkward box you have to grip wherever possible with the majority of the load away from your center of mass and you, hopefully, see the difference. This is why everyone who is physical capable and injury free — whether you’re 18 or over 50 — should deadlift in some form (more on this below). It’s as functional as functional movement can get. It doesn’t make sense to say, as some proclaimed experts do, “Don’t deadlift because it’s inherently dangerous” but then go about your daily life hoisting objects, kids, dogs, a case of bottled water off the ground. You’re going to pick up objects in daily life. Why not learn proper biomechanics, get stronger and become more resilient, and see just how strong you can become? When you start with a light weight and master correct form, deadlifts are safe. Learn proper technique from the beginning; it’s much easier than fixing bad habits later. You know how to properly deadlift using the video above. Now let’s address some of the most common mistakes people make when deadlifting, and go over how to correct them. If you’re new to deadlifting and have only been exposed to YouTube videos of horrific deadlift attempts and have been told deadlifting is “bad for you,” you may be intimidated by the movement. Get a knowledgeable coach to help you out, or take your time learning correct form with a light weight. There are several ways you can hold on to a barbell when deadlifting: the preferred double-overhand grip, mixed grip, hook grip, and using straps. There are some advantages and disadvantages to all. There’s more than one way to perform the deadlift movement pattern. Elevated deadlift – This was mentioned in the how to deadlift video. If you can’t maintain a rigid, neutral spine pulling from the floor, elevate the weight plates 1-4 inches using blocks, mats, aerobic steps, or safety bars in a power rack. I suggest using the lowest boost possible, so you use the greatest range of motion. Kettlebell deadlift – This variation can be performed with a single ‘bell between the feet and both hands holding the handle (you can also put the ‘bell on a weight plate or object 1-3 inches high to decrease the range of motion if necessary), or with a ‘bell on each side of the body. This is a particularly good option for someone who wants to learn the correct movement pattern but doesn’t want to use much weight. You will, however, be limited by the weight of the ‘bells. Sumo deadlift – This variation doesn’t work the low back to the same degree as the conventional barbell deadlift because of the stance. Since, with a sumo deadlift, your stance is much wider your torso won’t be as horizontal. The sumo deadlift loads the hips more, so some trainees find it more comfortable. That’s an old video so the quality isn’t too great. RDL – This is a great variation for beginners to ingrain the “hip hinge” movement pattern. It’s especially useful for someone who isn’t comfortable pulling a loaded bar off the ground, since the RDL starts from the top position. I commonly start new trainees with this variation and then progress them to the barbell deadlift once they build strength and confidence with this movement. Trap bar deadlift – This is a good variation, but it doesn’t work the low back, hamstrings, and glutes quite as much as the conventional barbell deadlift. For someone who can’t deadlift with a barbell, for whatever reason, the trap bar deadlift is useful. In the end, I recommend deadlifting with a barbell most of the time (or progressing to it once you’ve mastered some of the other beginner-friendly variations above, like the RDL) because it allows for more consistent, progressive loading. You’ll be able to lift more weight with a conventional deadlift than a kettlebell deadlift or RDL. And the barbell deadlift variations work the posterior chain (low back, glutes, hamstrings) a bit more than a trap bar deadlift, which puts more work on the quads. Regardless of which variations you use, deadlifts are one of the best exercises you can include in your strength training program. Like what you just watched and read? More good stuff is coming soon. Make sure you don’t miss it by joining the newsletter below and you’ll get the Beautiful Badass Mini Course as a gift.